Our Playtime is a five-minute video developed by the Sutherland Child and Family Interagency to demonstrate a particular structured play routine that requires parents to follow their child’s lead in play. This technique has proven to improve parent and child relationships, self- esteem and behaviour. It doesn’t cost money, it doesn’t require special skills and it only takes five minutes a day. You might want to look at one idea at a time in Our Playtime. These Utubes from St George Child and Family Interagency in partnership with St George Paediatric Speech Therapy Services have t ips to help your child speak and read in two languages. Below are links to the translated Utubes. Ideas to make the most of a child’s early development. Age specific ideas for parents of infants through to 5 years. Developing your child's early literacy skills. This video shows how parents can help their babies and young children develop the skills they will need for reading and learning throughout life. Listen to the song online or download the MP3 for FREE. Download and print your very own Countdown to School Calendar with tips and reminders on how to help your kids get ready for school, supplied by Families NSW. Click the image to download the ready-to-go PDF file, or alternatively, if you want to edit your own, and add your own images, use the Publisher version linked below. Editable version - Please note, you will need to have Microsoft Publisher installed in order to edit this calendar. Tips sheets and Book lists to help parents prepare their children before school for the world of reading and writing. Fact sheet for parents on language and communication development in babies through to 3 years. Helpful contacts also included. A series of 8 Tip Sheets with ideas for learning through play. 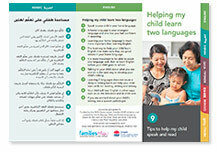 The Vietnamese and Arabic translated versions can be found in the Other Languages Early Learning section of this website. The why, when, how of reading with young children. 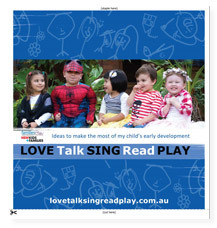 Ideas for parents on how support to incorporate early literacy into day to day living. A guide to how children learn about spatial ideas. Ideas for parents to use at home to help their children learn about addition, subtraction, multiplication and division. The benefits of making music a regular part of a young child’s daily routines. English Utube created by South Eastern Sydney on the importance of Playtime for children and parents.